My muse is in my heart. Hope y’all don’t mind the Closing Haiku. It’s been a while since I’ve done one. I’ve tried to stay out of the influencing of moods in the challenges lately. And honestly there does seem to be a bit more variety now that I no longer do an Opening Haiku. Just links this week. Not positive how long my window of internet is. NEW! Dajena Mason: A Haiku in the comments of Claudette’s blog. I had to include it. 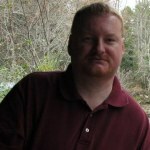 “I am currently working as a high school English Language Arts teacher. I love interaction with my students even when they are a pain in the… ahem.. yeah :D” And there is more at THIS link by scrolling to the bottom. Peter Bouchier: The poet | Wherever I lay my pen, that’s my home. Kat: Muse Haiku | like mercury colliding. Elusive: The Dreaded Block | Elusive Trope. J Lapis: 4 Real Muses | DarkLight Harbor. Pat B.: Erato Helps | A season and a time. Olga: Wisdom Penned | Stuff and what if. Claudette: Remembrances | to search and to find. Sandra: Excitement | Wild Daffodil. See what I mean by Make the Most of Your Post by visiting this Haiku and noting what all she connects it to. Swatiu: A mused disdain | imgrowing. Diedré M. Blake: Ponder | Toward The Within. Steven S. Walsky (Author): the muscovy duck | Simplicity Lane. Click the Author link above to go to Steven’s blog where you will find all the available places for each book. He’s varied. Dr. Kottaway: Musing | KO Rural Mad As Hell Blog. Nagrij or (Greg Pierce) yeah, I snooped. (Author): ADHD | Nagrij Writes the Hits You Never Knew Existed. You can check out the list of books on Amazon by clicking the Author link above. denis: My Photographs | Haiku hound. Shailzaa: Playing Games. GRR!!! | Fewunsaidwords. Steven: Calliope/Writer’s Block/Recovery | Ramblings of a Drabbling Mind. I’m screwed. Communications in main command center is down. Had to be driven in rover to FF Site MickeyD’s for brief use of systems. Some participants of challenge will be slighted in review or missed. Apologies now. Will make up for it later. Signing off for now, Space Ranger Ronovan. Kat: Three Cheers to Kat! | like mercury colliding. Man Kat can do. All the way from Nepal this former leader of OMRLP now spends her days enjoying words and the world around her. Her commentary of the season of the US national pastime is quite poignant considering the fate of various teams of late. Sandra: Orange | Wild Daffodil. To praise our Flower in residence would be like Gilding a Lily, so I’ll move on from here. Daffy left us with a bit of a mystery this week with her photography. Where, what, why, and when were not answered, although normally a forthcoming individual, she was forthawaying this time. See what I mean by Make the Most of Your Post. by visiting this Haiku and noting what all she connects it to. Steven: Thrush | Ramblings of a Drabbling Mind. Steven has been kind to us. Not only does he continue to provide his experimental Haiku but also a traditional one for those of us who need the in-your-face form. Elusive: Law of 22 Prairial | Elusive Trope. Hiding out in the wilds of PA after finding success in leasing out parts of the city with his name across the welcome signs for entertainment purposes, the Elusive one now pleases his visitors with writings and continues to grace our community each week with a Haiku offering. 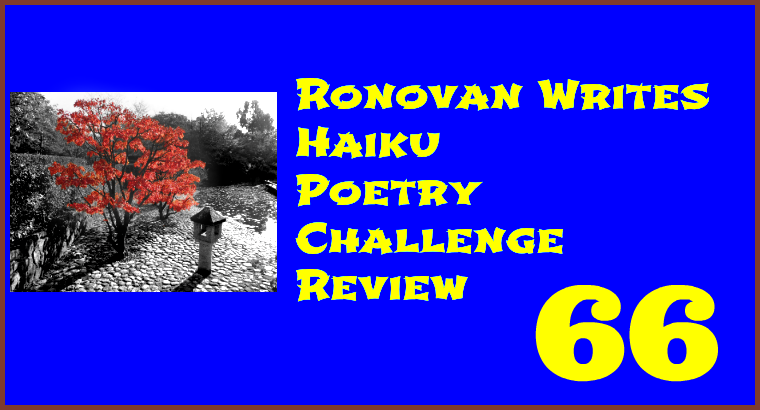 The Haiku is a great terror of an attempt this week. A true life or death of a read. And on his birthday as well. Olga: Political Uproar | Stuff and what if. Does she have a sister or cousin who appeared with Nicholas Cage, or perhaps that relative played someone with the same name as myself? Humor over with now on with the show. Olga shows her rampant political activism she has hidden from us all this time. Melissa Barker-Simpson (Author): Trick or Treat | M Barker-Simpson. Never knew a game show host and jailed football player had an offspring somehow but here we have the proof. Just remember to have your pets spayed or neutered or you may find some gloves near an uncomfortable scene. I believe the title gives away the Haiku meaning, as it should to some extent. Quite the creative flare for the imagery. Click the Author link above to visit her on Amazon. Pat B.: Four Cheers for Pat | A season and a time. Imagine a famous chef Brockett in your neighborhood. Wouldn’t you want to be her neighbor? This week Pat went cheerfully nuts with commentary on the nature of life in various facets. J Lapis: Calls to Cheer | DarkLight Harbor. Feeling blue today or precious as a gem? No? No worries, I believe our poet has it covered. Suspense in the later of the two offerings this week. Had us wanting to throw stones from feeling so blue but pulled things out at the last moment. Claudette: Echoes | to search and to find. Speaking of a real jewel, Claudette returns to us this week. denis: cheer the call | Haiku hound. A Haiku that could apply to man or beast and an image that works so well. And I made him dig for this image. Awesome me. Diedré M. Blake: Cheer & Call | Toward The Within. Never thought of that last line before. Cool mind going on here. Steven S. Walsky (Author): the call of Mickey | Simplicity Lane. Click the Author link above to go to Steven’s blog where you will find all the available places for each book. He’s varied. Dr. Kottaway: Call | KO Rural Mad As Hell Blog. 44 Players this week, and one amazing new person joined in. You definitely need to go check her blog out. Also you’ll notice something strange about the review. I did it in reverse. After the First to Offend it goes in last one in, first one mentioned and so forth. I thought, why not throw a monkey mallet into the mix. New to Offend this Week! NEW! Diedré M. Blake: “…a writer and art therapist, specializing in the treatment of eating disorders. She goes by “D.” and has been called a “Renaissance woman” by friends. Travelling has always been an aspect of her personal and family history. She was born in Jamaica.” Check out much more about this fascinating woman on her about page by clicking HERE. How Low Feels | Toward The Within. Never thought of that last line before. Cool mind going on here. Steven S. Walsky (Author): the words drift back | Simplicity Lane. A Haibun this week–a story–something you do need to read. A truly great piece of writing. Click the Author link above to go to Steven’s blog where you will find all the available places for each book. He’s varied. Shailzaa: The Tree | Fewunsaidwords. Very good way of using pine here. Two different ways of looking at it depending on the line you want to focus on. Swatiu: Lesson Learned | imgrowing. I think my title for this one fits. Really it does. Don’t care what y’all say. Steven: Taiga and Mo(u)rning | Ramblings of a Drabbling Mind. He went nature. Also make certain to check out the blurb at the bottom of his post. Becky G: For a Road Untraveled | Becky G? Oh, that’s me! Funny how two in a row used the prompt words in one line. Good use of photography to give her words more meaning or a completed meaning. denis: tomorrow | Haiku hound. A Haiku that could apply to man or beast and an image that works so well. And I made him dig for this image. Awesome me. Dr. Kottaway: Grieve | KO Rural Mad As Hell Blog. Rhymes all over the place in this one, and an expressionist pine is given. J Lapis: 5 Griefs and Pine-ings| DarkLight Harbor. Nice use of words you don’t use every day. I kind of like that. Pat B.: Refuge | A season and a time. Very nice. Also some nice comments as well. Elusive: Near the Clearcut | Elusive Trope. Yeah, I don’t always get the why of these things being done. Sometimes a necessity but most often not. Sandra: Allegory | Wild Daffodil. Ha, funny with this one. Remember, Wild Daffy is the queen of what I call Make the Most of Your Post. Nagrij or (Greg Pierce) yeah, I snooped. (Author): Oops | Nagrij Writes the Hits You Never Knew Existed. Yeah, I got it. I’m about an hour from their training facilities, my parents are about 5 minutes away. You can check out the list of books on Amazon by clicking the Author link above. Olga: Lost to Wisdom | Stuff and what if. Very interesting image. Keep looking at it. A glance won’t work. The Haiku itself has a great message. Clarence:(2 links) Futility | PrarieChat. Aaarrrgh! Find out a bit about Clarence’s acting career in the comments. And a second one: Susan Lucci’s Last Goodbye. Ha. Someone has been watching way too much TV this week. Kat: Grief Amidst the Pines | like mercury colliding. Okay, you have to love the dedication of this member. I stopped on the way home to get a photo of that sapling nestled amidst the pines. Replaced the first pic. Like I said…perfect timing for this prompt! Peter Bouchier: ‘mine pine’ | Wherever I lay my pen, that’s my home. I like this one. A positive side of it all. Excellent. I think that pretty much sums up how this challenge went. I was certain that Harp might throw some people but apparently I was wrong. Now on with the show. Annette Rochelle Aben (Best Selling Author, Radio Show Host): The Stringed Winged | Annette Rochelle Aben. Good number of likes to this one and I enjoyed seeing the community commenting. 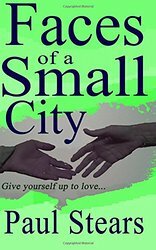 Check out Annette’s books at the Author link above and her Radio Show at the Host link. @YouAreTheExpert A side note here. 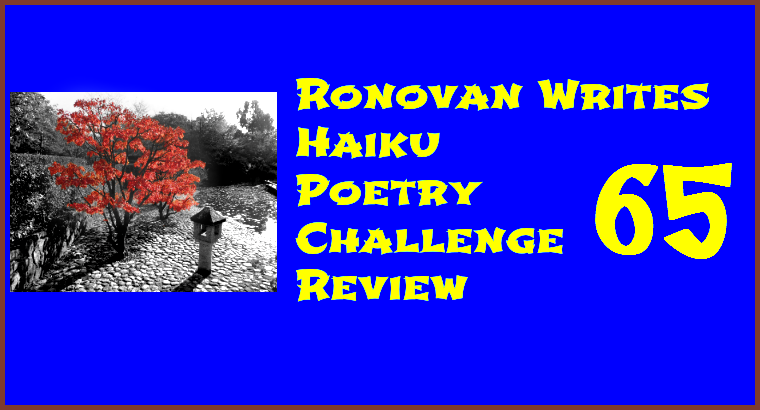 Me (Ronovan): Luminosity is Bliss | Ronovan Writes. I’ve enjoyed seeing the interpretations of my Haiku along with the interpretation of my explanation. Oddly, no one has come up with the exact meaning of it all. 🙂 But then I am a confusing kind at times. Steven S. Walsky (Author): ‘why harp’ | Simplicity Lane. Great to look at in a relationship or political sort of way. Or in a Rhino/Elephant Romance kind of way. Click the Author link above to go to Steven’s blog where you will find all the available places for each book. He’s varied. Clarence:(2 links) Tears, Mirth, and Dreams | PrarieChat. Touch of Irish history/mythology in this one. Google time folks. . And a second one would be Oooh…And It Makes Me Wonder. I think some of you will appreciate this one. So get the Led out. Kat: Your Fortune is Clear | like mercury colliding. Some of you have obviously NOT been to check this one out. And you are missing one cool presentation of the Haiku itself. Very well done. Oh, and the Haiku is cool too. Olga: One Direction Go | Stuff and what if. Some of you may be disturbed by that title I chose but don’t worry, I wouldn’t lead you astray. Swatiu: To See Clearly | imgrowing. This message is a huge one that relates very much to several articles I’ve written here on my own blog. Very nice. Elusive: The Reiteration | Elusive Trope. Dwell to tell what may have fail. Make certain to read the philosophical exchange in the comments. I love it when a Haiku generates a discussion. Sandra: Shadows | Wild Daffodil. Make certain to read BOTH Haiku. The first goes with the photograph for the Bluedaisy Weekly Photo Challenge that is linked to in her post. The second is more of a Haiku of joy with the word Harp. Remember, Wild Daffy is the queen of what I call Make the Most of Your Post. J Lapis: River Music | DarkLight Harbor. Pure nature with this one. Great imagery. People are loving that last line. Peter Bouchier: Sound or Music | Wherever I lay my pen, that’s my home. Great way his words flowed and the rhymes within the verses. And honestly my interpretation of it went great with his title. My comment explains what I Almost heard. Steven: Lullaby and Gymnopédie I | Ramblings of a Drabbling Mind. Some of Steven’s experimental Haiku but also a traditional one with a bit of a music lesson. I always love a good twofer post. 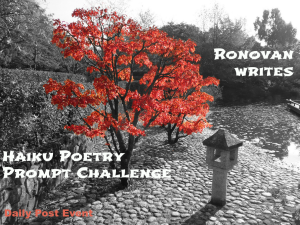 Haiku and learning. I wonder why I never do that? Nagrij or (Greg Pierce) yeah, I snooped. (Author): Fate | Nagrij Writes the Hits You Never Knew Existed. Giving this one a think. This can be viewed as a pretty deep one depending on how one wishes to approach it. You can check out the list of books on Amazon by clicking the Author link above. Ruby Manchanda: Clearly melodic | Whispering Thoughts. I like the take here on harp. A very insightful thought. I don’t mean my sentence but the Haiku.